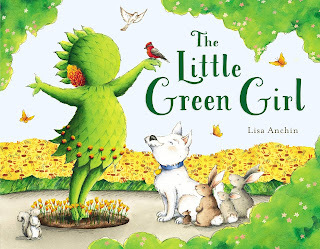 From the Book Jacket: The Little Green Girl is no ordinary plant. She dreams of exploring the world beyond her garden's walls. But branching out is hard to do... Especially when your gardener is rooted in his routine. For her gardener, Mr. Aster, the prospect of deviating from his daily routine--let alone leaving his beloved home--is unimaginable. Try as she might, the Little Green Girl can't uproot herself and set off on her own. To realize her dream, she'll have to find a way to show Mr. Aster that it's possible to carry a bit of home with you wherever you go. Why It's On My Bookshelf: Every year we teach the importance and value of having a growth mindset to our students. I thought this was a great story and example of fixed mindset versus growth mindset. The Little Green Girl is full of determination and perseverance. She wants to live out her dreams. But Mr. Aster seems to think that things should not change and there is no reason to need or want more in life. I really liked the concept that when we reach our goals we grow. If we stay in a fixed mindset we stay stagnant and don't truly blossom. If you are looking for a new resource to teach mindsets - this is a great story. i had a sneak peek at this lovely title from Lisa, and I so agree with your comments! THE LITTLE GREEN GIRL makes a lovely, subtle statement that growing and changing is essential for fulfilling our goals and dreams. And the artwork is gorgeous!